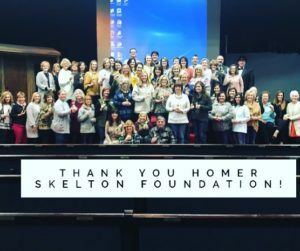 Fifty-two faculty members found out Friday they will be receiving grants from the Homer Skelton Foundation. We are so thankful for the $370,000 being awarded to our faculty and students! These grants allow us to enhance our programs and services while keeping tuition costs at a minimum. We mentioned earlier this month the addition of many new programs and upgrades we will be making for 2019-2020 including additional elective classes, creation of string orchestra, renovation to the baseball complex, addition of a robotics team, and an indoor playground for preschool students. Friday, we were thankful to have Mrs. Dot Maki and Mrs. Michelle Chapman with the Homer Skelton Foundation, on campus with all of our teachers as they were told they were receiving grants. •Additions to our outdoor reading garden; •Alternative seating throughout many classrooms; •Grants for professional development on “Bringing up Boys: A focus on teaching our boys”; and a grant to send high school English teachers to the NCTE National Conference. Thank YOU, Homer Skelton Foundation!